The TravelLite 60 Reverse-Folding Tripod from Sunpak remains true to its name with a lightweight aluminum construction that weighs just 2.4 lb. The tripod is also conveniently compact, folding down to only 14.5" to fit into its included case. Its 5-section legs utilize twist locks, allowing it to support up to 11 lb, enough for many DSLR's and mid-range zooms. The included single-action ball head is removable and features a quick release plate for easy attachment. The non-marring rubber tipped feet allow for steady and secure placement and each leg can be adjusted to various angles for uneven terrain or low-angle shooting. The bottom of the center column features a ballast-hook for holding extra weight to increase the tripod's stability. 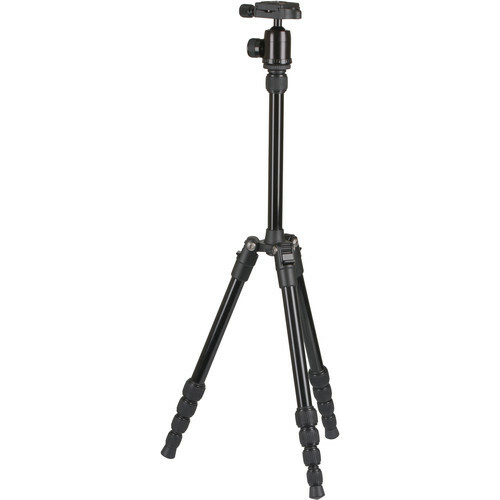 Box Dimensions (LxWxH) 17.2 x 5.0 x 4.7"
TravelLite 60 Reverse-Folding Tripod is rated 4.0 out of 5 by 3. Rated 4 out of 5 by Anonymous from Ultimate Travel Tripod! This tripod is the perfect solution for those who need a sturdy tripod but don't want to bother with the weight and bulk. This tripod easily fits in a backpack or messenger bag and is incredibly light. Only downside is that it does not have a handle to to help with panning. Not the best for capturing movement, just sturdy locked down shots. Rated 4 out of 5 by Craig from A decent back pack tripod I needed a tripod light and compact enough to haul around while on kayak, hiking, and camping trips. It has been pretty good tripod so far. It's quite versatile and folds up pretty small. I have noticed that when I have my D5300 w/55-300mm lens on it, that I have to really make sure to tighten the head down good or it may slightly drift down. While it's a very small drift, it can cause scene composition issues with shooting close in. Just remember to make sure its tightened good when using a bigger lens. How do you release the camera plate? Asked by: CHRISTIAN HANS H.
There is a 1.25 thumb screw near the camera plate. Unscrew it and the camera plate should just slide off. Do not lift straight up, just slide if off. Is it compatible with mirrorless cameras from SONY (such as a6000 series/E-mount series)? It's compatible with my Sony a6000. Can you move the center column up and down or is it stuck all the way up ? Yes, they are adjustable. See the sheet of operating instructions included in the box. Can an iPhone adapter be attached and will it be able to flip to portrait mode? Is this an Arca plate and can I use my Peak Design product with it? This is not an Arca-Swiss plate, it is an Arca-like dove tail design and only works with the included tripod head.